From the run of 1889 when 10,000 strangers came together in one day to build a city until the beginning of the turbulent sixties, downtown had been the commercial, retail and entertainment heart of Oklahoma City. In the subsequent forty years, the city struggled to re-imagine and rebuild and in the process overcome the centrifugal forces of suburban growth and a brutally commodity based economy. 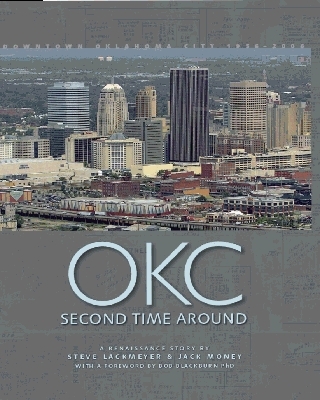 OKC Second Time Around is the narrative and visual history of that unique experience. Steve Lackmeyer and Jack Money's narrative pulls together the almost serendipitous combination of circumstances that resulted in today's growing, vibrant, downtown Oklahoma City. Illustrated with more than 250 historic photographs, OKC The Second Time Around will provide fascinating reading for those who have lived this renaissance, for students of Oklahoma history, as well as all those interested in the peculiar, frail and highly individual nature of a city's reinvention. Watch Steve and Jack's interview with Alex Cameron on KWTV. OKC: Second Time Around is a remarkable preservation of a slice of Oklahoma history that gives credit where credit is due and maps for future generations the elements of success that can be emulated in any major city in the nation. The book is a must-read for anyone interested in the story of the successful rebuilding of downtown Oklahoma City." "In a country where very few newspapers have architectural critics on staff, we here in Oklahoma City are fortunate to have two talented writers who report on architecture and the built environment. In a country where bad news travels fast and negative news travels even faster, we here in Oklahoma City are fortunate to have two talented writers who report on our work and who tell the positive stories of how design improves our city and state. Steve Lackmeyer and Jack Money write great, thoroughly researched, upbeat articles about places that impact Oklahomans' lives. They write stories about businesses, buildings, new construction, historic preservation, urban renewal, landmark rehabilitations, and public places. Their writings tie together design, economic development, and community development while tugging at our memories and pulling on our heartstrings. In order to write about these subjects, they just do not sit behind a desk and scan the newswires. They get out, attend events, meet people, and stay in contact. In a world of clip and paste news articles, these two writers create from scratch. It is refreshing. During this Statehood Centennial year and during the American Institute's 150 Anniversary, we architects celebrate the history of the built environment and the influence of our profession. With great foresight, by relying on hindsight, Steve Lackmeyer and Jack Money provided us another tool to celebrate architecture, both the buildings and the profession. Relying on archives and many of their own interviews and articles, these two gifted writers recently published OKC Second Time Around, an incredible story of the town in which we all choose to live and work." Beautifully designed, this history of downtown Oklahoma City (1956-2006) will fascinate all who witnessed the city's transformation. Photos include dramatic aerial views and endpaper maps contrasting 1950 to today. The forward is by Bob Blackburn, Oklahoma Historical Society Director. Few remember when OKC was out-ranked only by NYC and Chicago as a convention destination, before suburbs stole the locals and dry laws repelled the visitors. Stories include those of Dean A. McGee's vision; I.M. Pei's urban renewal plans, councilman I.G. Purser's "Downtown is dead, and we helped kill it ... no major retail, no major attraction and no place to eat"; the bombing, a tragic second urban renewal in one blast; MAPS Mayor Ron Norick's campaign to "Believe in Our Future"; and MAPS-inspired developers and fundraisers like Carolyn Hill, whose beautiful art museum rivals the MAPS projects.